Would you say, reader, that you like history? And if so, do you demand some sort of authenticity, some truthiness, from its depiction in fiction? In other words, when you read historical fiction, is it partly to learn something about the past? Or is a historical setting more like a fancy suit that just makes everything in a story snazzier? If you're a purist of the former outlook, that historical fiction must seek to teach the reader something of the past, you'll be disappointed by virtually every single historical fiction book in existence, since there are basically only two types of historical fiction authors out there: the career novelist and the career historian. No matter how intensely novelists research history, they've dedicated their life work to perfecting their writing, meaning they tend to apply a thin historical veneer to what is otherwise a simple story of love, revenge, or both. Conversely, historians busy themselves studying history, which leaves little time to burnish their fiction writing skills, and as a result their accounts tend to be weighed down with those giant cement shoes known as "too much detail about stuff no one cares about anymore" and "'character development? I can't do that—these are people from history!'". It's incredibly rare to find a novelist who possesses deep knowledge and understanding of history, or a historian with a gift for fiction writing (or in many cases, nonfiction writing too, sad to say). Historical fiction, especially those works written by historians, also faces a fundamental problem: the past totally sucked. No matter which time period a given story is set in, the world is almost certainly dirtier, crueler, more prejudiced, and less convenient than ours, whatever the current world's faults. I can hear, from among my audience of literally dozens, a chorus of gasps that I could prefer the current world to the glorious wonders of the past, but answer me this, you Gone with the Wind-loving romantics: can you honestly say, with a straight face, "yep, 1864 America was a great time to be alive!" Or perhaps you think wistfully of Qing-era China, but conveniently forget about foot-binding, the indiscriminate slaughter of civil wars, opium, or predatory Western imperialism. Or for lovers of English/French history, it's pretty hard to see in rosy hues the endless slaughter of, not only the enemy across the Channel, but also the people at home if they were not of that moment's favored religion, wouldn't you say? Segway! 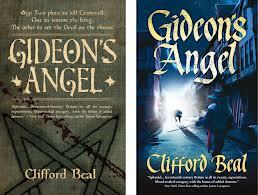 Gideon's Angel is set in, if not really about, Cromwell's England. And after reading my ranting on historical fiction above, you're probably wondering by now which Clifford Beal is: a historian or a novelist. Nothing a Google search won't answer! Yet before you shake your heads in disgust at the effrontery of a novelist marinating his story in the fragrant juices of history, know this: just because a story is spray-painted with an old-looking patina doesn't mean it's a bad story. So if you are of the historical fiction camp—history as veneer—then Gideon's Angel is perfect for you. Because it's actually quite an entertaining romp, as such stories go. Most historical fiction writers cannot resist the temptation to have their protagonists interact with the Great Men (or, all too infrequently, Women) of History, and Beal is no exception. Perhaps they hope to soak up some relevance for their stories via contact with well-known personages, but the trade-off is their depictions of ordinary life/people get the short stick. 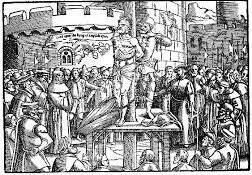 So, in Beal's Cromwellian England, our historical veneer consists of little nuggets like, say, pistols not firing correctly, the use of the word 'hanger' instead of more familiar latter-day terms like cutlass, or brief descriptions of the hearty fare in inns—good as far as they go, but few and far between. On the other hand, Beal does a fine job creating characters (Billy is especially good) we want to see through to the end of their adventure, though at times their motivations are inexplicable (why on earth would Richard join such a silly conspiracy, given his knowledge and skills?). But what if you are a serious student of history, and yearn to discover truths about the glorious past in each historical fiction volume you read? Then read a history book—you'll see just how scarce glory was in the past. This is actually my one serious objection to Gideon's Angel, which purports to depict a period of history rife with religious and political intolerance but instead presents a rosy picture where in due course a Protestant Royalist joins forces with a Catholic swashbuckler (what 17th century tale is complete without an extended cameo from everyone's favorite musketeer? ), a Spanish Jew, and a bunch of Republican Freemasons to take on the forces of Hell (literally) by casting Jewish prayer-spells in Hebrew that work for Christians too. Is it exciting? Absolutely! Might it give the casual reader the grossly mistaken impression that England at that time was an utopian paradise of tolerance where Jews and Christians of all types amiably agreed they were all servants of the same God and let's be BFF? You bet. The final verdict, then, is that Gideon's Angel is thoroughly entertaining, and well-crafted stylistically (though Beal does lay on the archaic vocabulary rather too thickly, I felt), but definitely falls into the historical fiction camp, which might be a problem for some readers—though, sadly, it's precisely those for whom it won't be a problem that this is a problem. I remember years back a rash of people basing their understanding of the Roman Empire on Gladiator—I only pray this book won't create a similar wave of 'experts' on Cromwell's world! Just enjoy it for what it is: an entertaining sword and sorcery and sandals and demons and stuff story.